Sadly Hickory is not one of the wood types offered. Back in June I made my PlayStation 4 look old and classy with a wooden cover by a company called Toast. It was fast and easy. Doing the same thing to my Nintendo Switch took a little more doing. Toast makes covers out of actual wood veneer for all sorts of devices, from smartphones (we can just call them phones now) and tablets to laptops and consoles. The Switch cover is one of the company’s latest additions. They’ll cover just the dock for $24, just the Switch and Joy-Cons for $39, or everything for $59, with custom etching $5 extra. The full Switch cover comes with front and back of the Switch, front, sides and top of the dock, and front covers for two Joy-Cons and the game controller dock. There is a known issue that the factory paint finish on the Nintendo Switch console and controllers is not very durable. In our testing, sometimes we noticed micro, pinprick-sized pieces of paint pulling off the console or Joy-Con controllers upon removal. We don’t know if this will become more of an issue over time and cause larger pieces of paint to pull up with covers that have been installed for a long time, so if you are concerned about keeping your Switch 100% pristine, maybe just go for the dock instead - the dock isn’t painted, so you can safely Toast it to your heart’s content. Being out of control and not caring who or what I hurt, I went for the full monty. As with my PlayStation 4 cover, Toast wanted to know if I wanted a design. Having done squirrels on the PS4, I went for the polar opposite of squirrels, 11th President James K. Polk. Out of the four wood colors Toast offers (oak, ash, ebony and bamboo) I went with ash, because I’ve heard a lot of ash fans wanted to see it on the Switch. The Toast people probably think I am deranged at this point. The first order of business is covering the Switch itself. I started with the back of the unit, because I read the provided instructions. The little dots of backing left on the wood sheet are to make it easier to take off later, should the need arise. Application is pretty simple: line up the panel with the vents on the back and the kickstand and stick it. Then roll down the segmented bits at the top and bottom. The front is a little more tricky. To lay it down I had to line it up with the edge of the back, then slowly bring it down as I peeled the backing off, making sure everything stayed in line. Since the power and volume buttons on top of the Switch are recessed, Toast provides wooden button covers. This is where I screwed up a bit. For one, I had to peel back the front plate and realign it, which caused what looks like a small rip between the seams on the top right of the screen piece. The front and back pieces could be more flush, and I should have used tweezers for the power button to keep it straight. A little sloppy, but everything still worked. The Joy-Cons were really easy, with just a single panel each and plenty of reference for lining everything up. Again, it’s a little rough here, but the whole thing comes together nicely. The wood grain feels really great against the fingertips when holding the Switch in tablet mode, and it gives the portable console a soft, natural vibe. Though I hardly ever use it, I also applied the cover to the Joy-Con Grip, for the purpose of matching. Finally we have the Switch dock itself. The cover for the dock comes in four pieces—the front, both sides, and two strips for the top. Aside from pressing down the curves at the top of the sides, this was about as easy as it gets. The only major issue with Toast’s wood cover, aside from potential paint peeling, is that with these wooden panels attached to the Switch, the fit inside the dock is incredibly snug. I have to apply pressure to push the thing down. It docks fine, and I don’t think I’ll be worrying about the dock scratching my screen any time soon, but it’s pretty damn tight. And then there’s the threat of what potential Switch bending might do to these covers, but so far mine has remained flat and I don’t want to think about it. I don’t know about you folks, but I like this look. 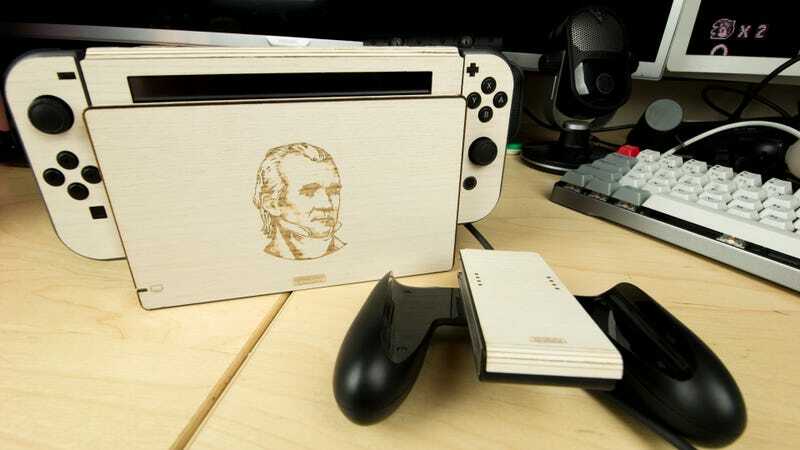 Between the wood and Mr. James K. Polk, the Toast cover gives my Switch an air of class and sophistication befitting one of the best pieces of hardware Nintendo’s produced in years.